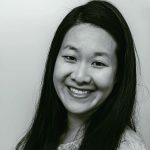 Published Jul 19, 2018 By Julia 3 CommentsThis post may contain affiliate links. An easy keto chicken salad recipe with bacon, avocado, green onions, shredded cheddar cheese, and caesar dressing. Great for low carb and gluten free diets. 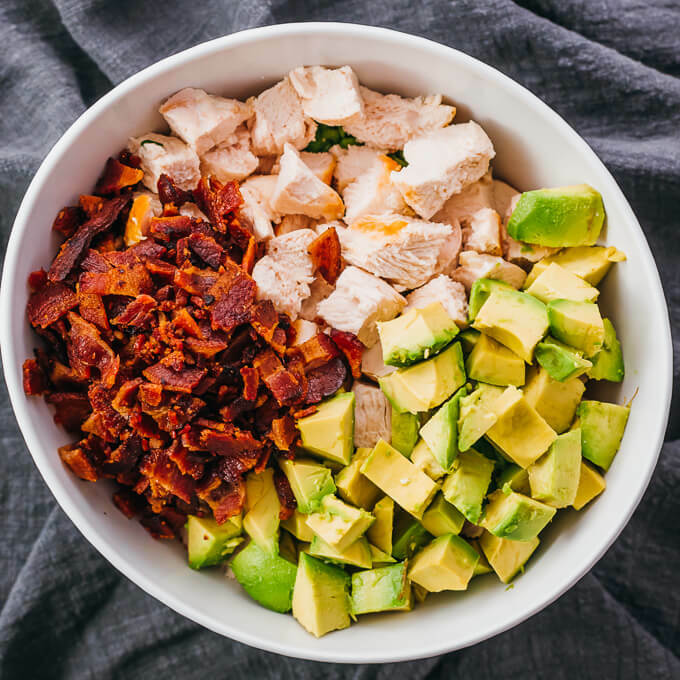 This chicken salad is pretty easy to make: fry the bacon slices until crispy, cook chicken in bacon fat, and toss all ingredients together with the dressing. Refrigerate until chilled, and serve. 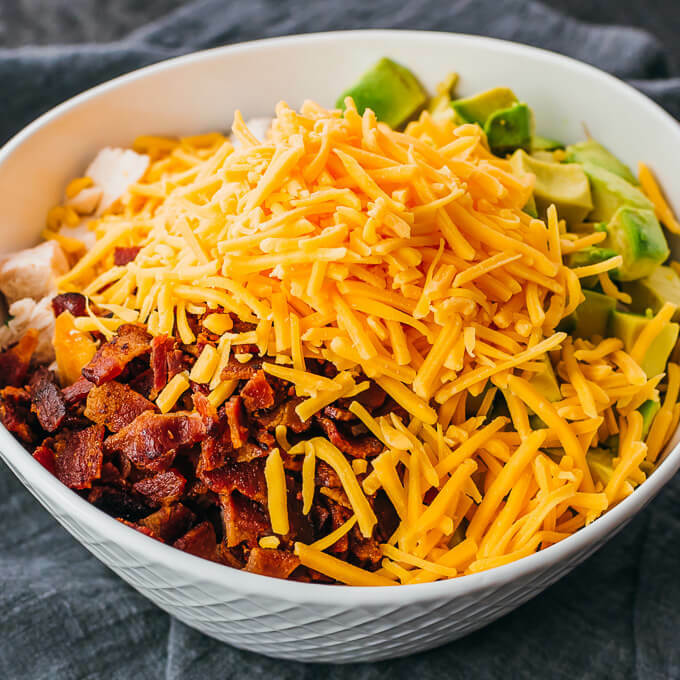 The avocado and shredded cheddar cheese give the salad a smooth and creamy texture, and the crumbled bacon adds a nice crunch. 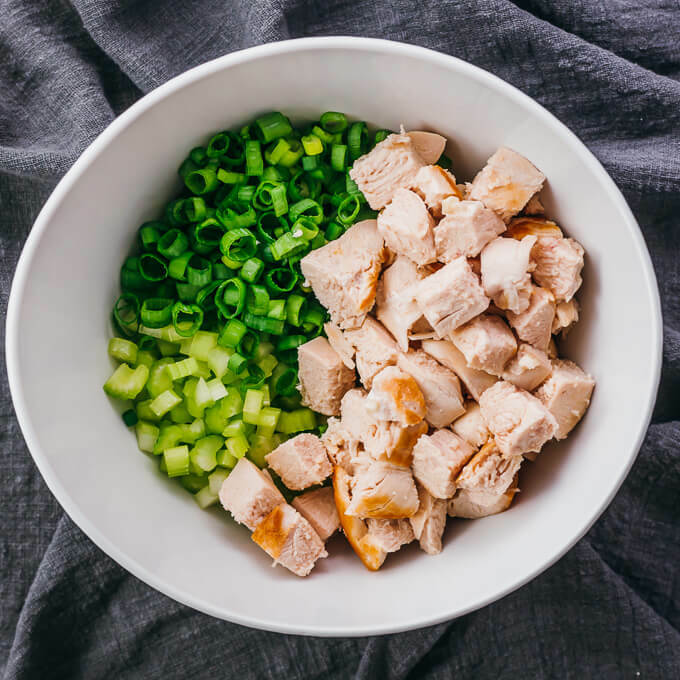 The sliced scallions and diced celery add a fresh taste to the salad, and the chicken is deliciously tender. This recipe is great for anyone looking for a summer salad or lunch that’s refreshing, healthy, and filling. 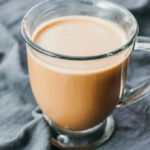 You don’t need to be on a keto or low carb diet to enjoy this. There are no special ingredients; they are simply naturally low in carbs. 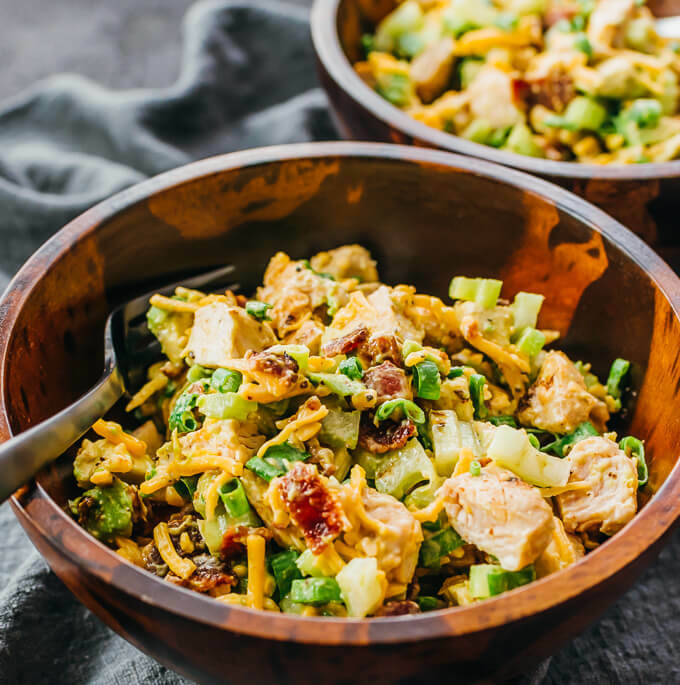 This chicken salad is keto friendly because every ingredient was intentionally selected for its low carb macronutrient profile. Meat doesn’t have any carbs, which is why there’s plenty of chicken and bacon. The other ingredients, like avocado, cheddar cheese, scallions, celery, and dressing, are all very low in carbs. 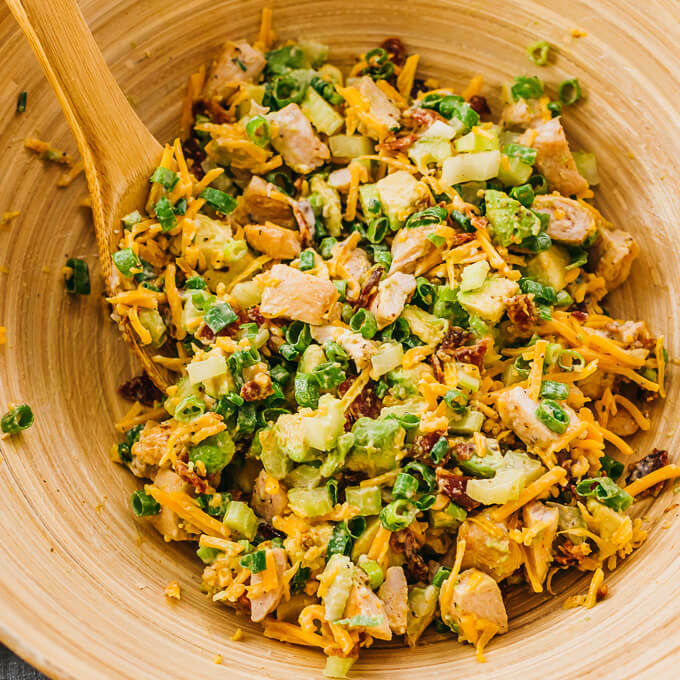 In total, this chicken salad comes out to only 3g net carbs per serving! 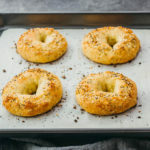 And these are no small servings — they are large salad servings, more like a main dish than a side or appetizer serving. 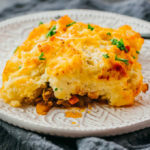 Each has about 640 kcal, so they’re pretty hearty and filling. The recipe includes instructions for cooking bacon and chicken, in case you start with raw ingredients like I do. But you certainly don’t need to. To save time, buy pre-cooked chicken at your grocery store, such as rotisserie chicken. Trader Joe’s has a great selection of pre-grilled chicken strips that you can use. 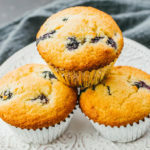 Cut them into small bite-sized pieces and use the cooked amount indicated in the recipe. You can save even more time by buying cooked bacon. It’s never going to be as crispy as homemade fried bacon, but it might be worth the time saved. Then this will become a no-cook meal and all you have to do is throw all the ingredients together and toss. I use caesar dressing because it’s one of the lowest carb dressings out there. You can also use ranch or buffalo, but they’re a bit higher in carbs. Whatever you use, read the nutrition label before using. My storebought caesar dressing only has about 0.5g net carbs per 2 tablespoon serving. This salad is best served chilled. After assembling it, keep it in the refrigerator for an hour or until cold. Don’t wait too long, because the avocado will start to turn brown. It’ll still taste great, but won’t look as nice. 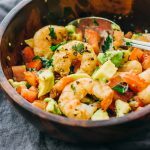 If you need to make this salad ahead of time, wait to chop the avocado until right before serving. That way it’ll look its best. Cook bacon slices in a pan over medium heat until crispy, flipping them occasionally. Transfer to a paper towel to drain. Crumble into small pieces. If using raw chicken: Drain most of the bacon fat but leave a thin layer covering the pan. Add chicken and cook for about 10 minutes over medium heat. Flip chicken pieces and cover with a lid. Cook over medium-low heat for another 10 minutes or until cooked through. Let the chicken cool for 5 minutes, then cut into cubes. In a large bowl, toss together all ingredients. Add salt and pepper to taste -- I usually add about 1/4 teaspoon each. Add more dressing, if desired. 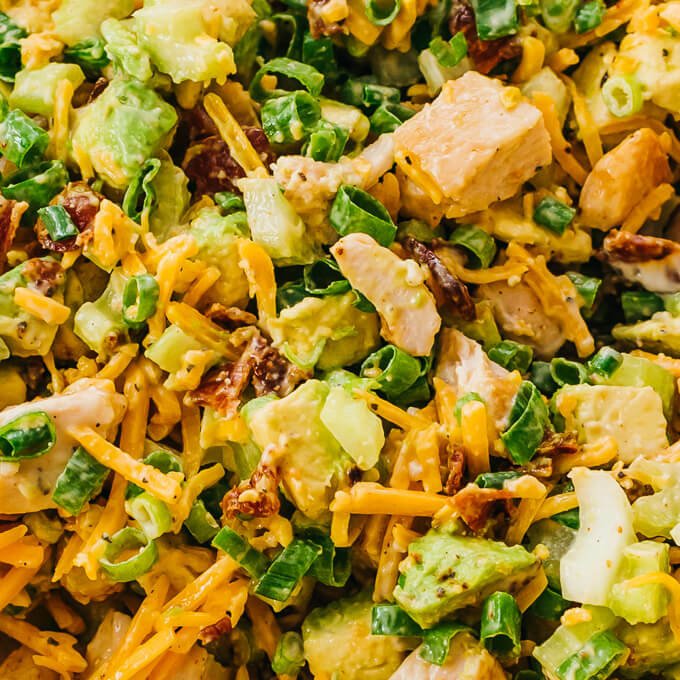 This recipe yields 3 g net carbs per serving (1 large chicken salad or 1/2 of recipe). 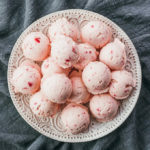 I’m right on the fence about trying keto, but recipes like this make me want to. 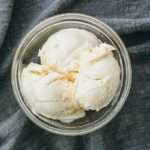 I love everything in this so I can’t wait to try it – keto or not. Thank you! Just beautiful. And I love that you show how easy it is to make your own chicken salad instead of going and spending a fortune at whole foods!